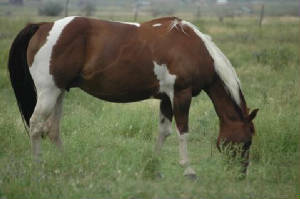 Bayb was one of the first registered horses we purchased and originally she was intended to be a riding horse for Craig. We bought her from a 'horse dealer' who suggested we just 'butte her up and she'll be ready to go.' We decided that Bayb, with her classy looks, excellent disposition, and wonderful pedigree would be best served in her 'mature' years as a broodmare. She had a beautiful filly in 2004. In early August 2005 Bayb delivered a beautiful breeding stock palomino colt. In April, Bayb, tired and weak from being the world's best mother went to heaven. We will always miss her, and know she's watching over our herd in heaven as she did while she lived here on earth. Rest in Peace, beautiful, loving, fiery Bayb. WE MISS YOU!